Both the public and the media focused last week on the increasing violence in Libya, but Americans also closely tracked news about a related concern – the impact the crisis in the Middle East is having on oil prices at home. About two-in-ten (21%) say they followed news about the rising price of oil more closely than any other major story, according to the latest News Interest Index survey conducted Feb. 24-27 among 1,009 adults. Comparable numbers say they most closely followed news about the situation in Libya (19%) or the budget disputes in Wisconsin and other states between state governments and public employee unions (18%). Each of the top stories attracted strong interest. Using a separate measure, fully 50% say they followed news about rising oil prices very closely, while 49% say they followed news about the economy that closely. That is the highest number tracking the economy very closely so far this year. Nearly four-in-ten (38%) say they followed news about the growing violence in Libya very closely, about the same as the number that followed the unrest in Egypt very closely the week that Hosni Mubarak resigned (39%, Feb. 10-13). About as many (36%) say they followed news about the confrontations between governors and public employee unions that closely. 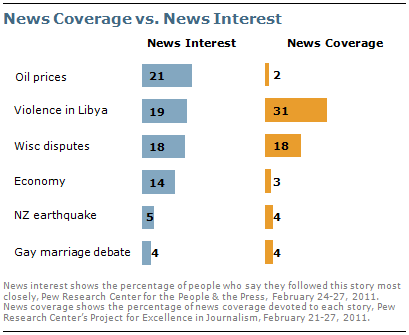 News about Libya topped coverage, accounting for 31% of the newshole, according to a separate analysis by the Pew Research Center’s Project for Excellence in Journalism (PEJ). News about the budget standoffs in Wisconsin and other states made up 18% of coverage. News about oil prices, on the other hand, was limited, accounting for just 2% of the coverage measured by PEJ. The public is typically very attentive to news about fluctuating gas and oil prices. The sharp run-up in gas prices following Hurricane Katrina was among the most closely followed stories of the previous decade, as was news about the falling price of gas in the fall of 2008. (See “Public’s Top Stories of the Decade – 9/11 and Katrina,” Dec. 30, 2010). The recent price increases also come at a time of continued interest in the health of the U.S. economy; 14% say they followed news about the economy most closely last week. Not including news about budget fights at the state and federal levels, news about the economy accounted for 3% of the newshole. Fewer say they very closely followed news about a deadly earthquake in New Zealand (20%) or recent developments in the debate over gay marriage (19%). Five percent say they followed news about the earthquake more closely than any other top story, while 4% say they followed news about gay marriage developments that closely. Each of these stories accounted for 4% of coverage last week, according to PEJ. There are only slight differences in interest in these stories in most demographic groups and among partisans. Those with household incomes of less than $30,000 are more likely than those with incomes of $75,000 or more to say they followed news about oil prices more closely than any other news (26% vs. 17%). Oil prices were clearly the top story for those earning less than $30,000, while affluent households also paid considerable attention to the situation in Libya (22% most closely) and the ongoing fight in Wisconsin (21%). Not surprisingly, people in the Midwest are more likely to say they followed the disputes in Wisconsin and other states most closely. Nearly three-in-ten (28%) say this, compared to 16% for those in Northeast and South and 11% for those in the West. 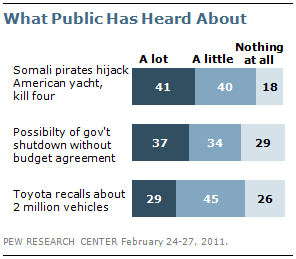 About eight-in-ten (81%) say they heard a least a little last week about Somali pirates hijacking an American yacht and killing four hostages; 41% say they heard a lot about this, while 40% say they heard a little. Few (18%) had heard nothing at all. The media devoted 3% of the newshole to the pirate story. Most of the public (74%) also says they heard at least a little about Toyota recalling about two million vehicles. About three-in-ten (29%) say they heard a lot about this, while 45% say they heard a little about the recall. These findings are based on the most recent installment of the weekly News Interest Index, an ongoing project of the Pew Research Center for the People & the Press. The index, building on the Center’s longstanding research into public attentiveness to major news stories, examines news interest as it relates to the news media’s coverage. The weekly survey is conducted in conjunction with The Project for Excellence in Journalism’s News Coverage Index, which monitors the news reported by major newspaper, television, radio and online news outlets on an ongoing basis. In the most recent week, data relating to news coverage were collected February 21-27, and survey data measuring public interest in the top news stories of the week were collected February 24-27, from a nationally representative sample of 1,009 adults. The analysis in this report is based on telephone interviews conducted February 24-27, 2011 among a national sample of 1,009 adults 18 years of age or older living in the continental United States (678 respondents were interviewed on a landline telephone, and 331 were interviewed on a cell phone, including 144 who had no landline telephone). The survey was conducted by interviewers at Princeton Data Source under the direction of Princeton Survey Research Associates International. A combination of landline and cell phone random digit dial samples were used; both samples were provided by Survey Sampling International. Interviews were conducted in English. Respondents in the landline sample were selected by randomly asking for the youngest adult male or female who is now at home. Interviews in the cell sample were conducted with the person who answered the phone, if that person was an adult 18 years of age or older. For detailed information about our survey methodology, see: https://www.people-press.org/methodology/detailed.